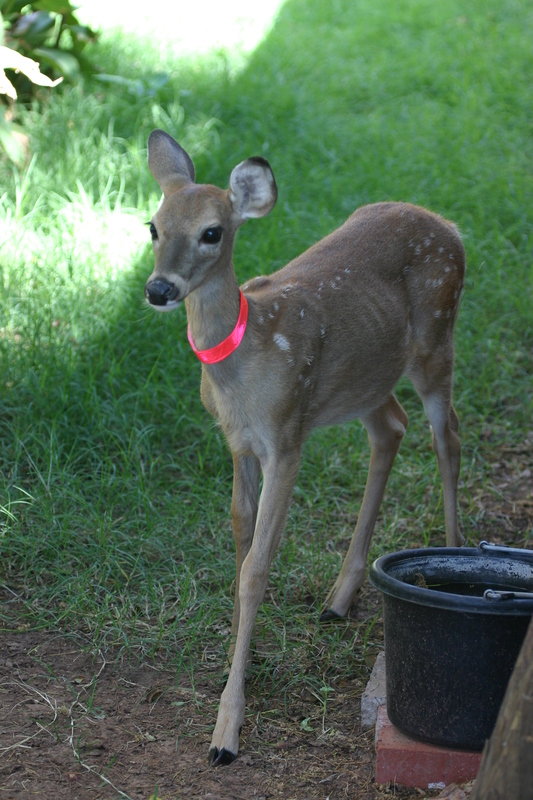 Daisy still has a few fawn spots at 4 months old. 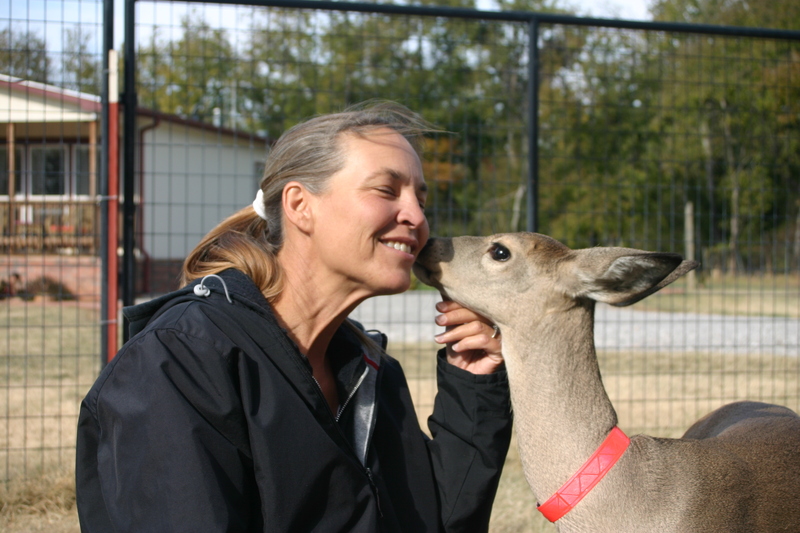 When I applied for my rehabilitation permit with the State of Oklahoma Department of Wildlife Conservation, I was finally laying down the legal groundwork for the care of wild orphans. Over a ten-year period, FD and I have taken in numerous birds and small mammals. Each time I was a little nervous about having a wild specimen, knowing it was considered illegal to do so. After a little research on my responsibility as a rehabilitator, FD and I set out to construct the appropriate pens and cages to be ready for the sorts of wildlife we were interested in caring for. Once that process was completed we made a call to the local game warden for an inspection of our facility. The warden asked a number of questions. What type of animals/birds were we interested in rehabbing? What experience did we have in rehabbing? How would we handle certain scenarios? Where would we release wildlife when it was time to be returned to the wild? There were no right or wrong answers. I got the feeling that the game warden was more interested in knowing our intentions for rehabbing and discovering our interests in wildlife. Daisy grazing in her oat patch… spoiled girl! 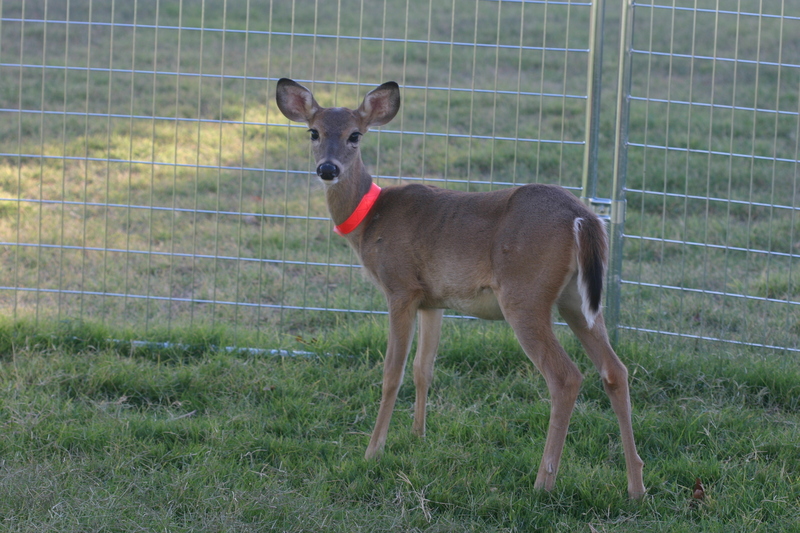 When we acquired Daisy deer, it was just like raising any other orphaned animal. 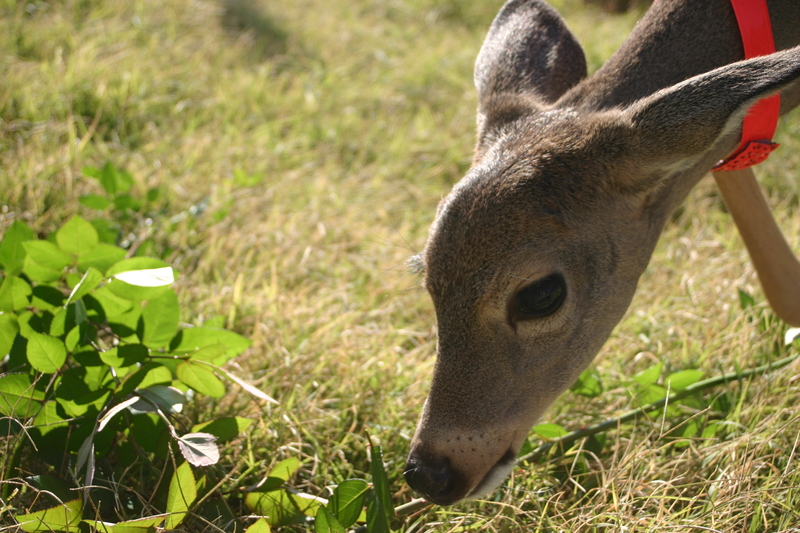 We did a lot of research online, and were fortunate to connect with a woman from Texas who had raised an orphaned fawn as well. We spent hours educating ourselves on white-tailed deer and their habits. While we struggled to bring up this sweet baby doe in our home, I know Daisy struggled to adapt to her new, human world… living in a house, drinking from a plastic bottle, taking cover behind a weird obstacle called a couch, carefully walking on rugs to avoid doing the “splits” on the tile, being cared for by strange-looking parents, and having four Japanese Chin as siblings. She lived in our house a little over a month until she started bathroom business on her own. After that, the old chicken barn became her new home. A large, fenced area became her grassy, roaming ground. A thick row of cannas provided a hiding place for our spotted fawn, and an old walnut tree and mimosa tree provided shade from the scorching Oklahoma sun. She acclimated herself to her outdoor surroundings and seemed to thrive in her new environment. Daisy is a big girl at 5 months old! 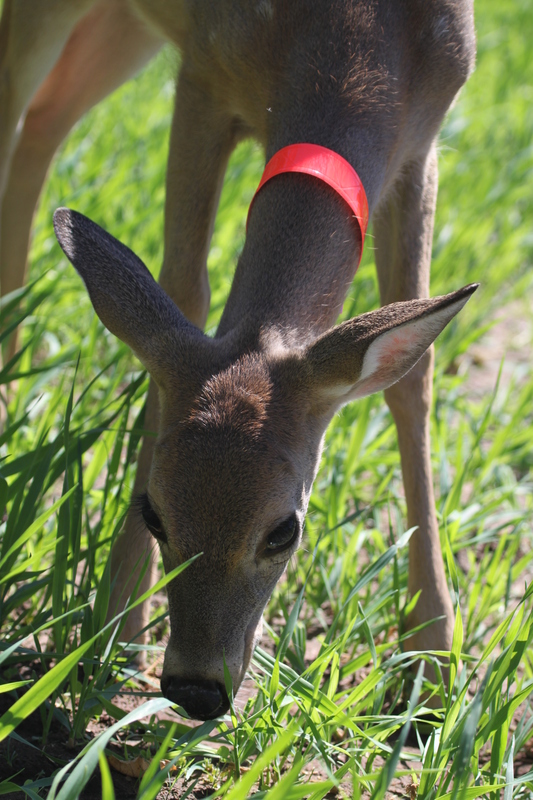 As she’s grown, it’s been increasingly difficult to think about life as a deer raised by humans. I often consider her adjustment to the wild. Some survival skills she knows inherently, but I ponder the aspects of deer life that her mother would have shown her and taught her if she had been raised by her own kind. I worry that she will have difficulty finding a herd that will accept her. I worry that predators might be more of a threat to her. She may not be as alert to danger having been raised in a protected environment. And I contemplate her approach to humans. While she is not friendly and runs from visitors to our home, I often wonder if she will be wary of humans as she should be in the wild. So many concerns, yet her experience will be what it is. I must accept that. For the wild deer do not fear death or worry about their next move as we humans do. They simply know survival and flight. Rose bush trimmings make a tasty treat. Daisy’s date of release is a decision we enter into carefully. We have decided to wait until the threat of hunting season is over. Several neighbors in the area have agreed, since the woodland area beyond our property is leased to hunters this year. However, the decision to wait has brought difficulty of its own. Daisy is now 6 months old and will be nearly 7 1/2 months old when we set her free. She is increasingly discontent in the confines of a pen. She is not the docile little fawn she was just two months ago. She is a young lady who likes to get silly and play the “hoof” game, standing on her back legs coming at me with hooves at the ready. She tries her dominance every so often. She does not appear to be very big or dangerous, but she has injured me a few times just goofing around. I have a real respect for her strength and her abilities. She is, after all, a wild-bred deer and not a cute little pet. Holly on day 3 of rehabilitation, a little more alert. Two weeks ago we acquired a young doe that had been hit by a truck while crossing the highway. Holly (named by the family that brought her to us) was in shock when we got her. A wild deer, she was strangely oblivious to humans touching her and little children chattering all around her. She didn’t seem to have good vision and couldn’t hear. I wondered if she could sense anything. Her hind legs were lame and her back seemed to bother her. We put her in the adjoining pen to Daisy and kept the two separate for a couple of days. Holly slept almost constantly the first few days. At times she appeared to be dead when I checked on her. She ate little. By day five, I knew Holly was going to be fine. She was returning to a wild nature. Her head jerked my way as I headed out the front door of our house. She could see me now, and ran to the other side of the pen on my approach. She appeared to be nibbling weeds and tree leaves, and she was drinking a lot of water. Each day she shows improvement, exhibiting a desire to be free of the confines of the pen. Daisy and Holly often keep each other company. It has also been beneficial for Daisy to have Holly here. She’s more calm having a companion in the next pen. We have tried several times to put the two girls together but Daisy wants to play “hoof” and Holly can’t raise up on back legs to hoof back. Eventually, Daisy gets too rough and Holly cannot defend herself. I am sure in part, it is not just a game of playful hoofing. For Daisy it’s about dominance. So, we keep them separated. What we hope for is to release them both when hunting season is over. It would be wonderful if they could go off together to try to join a herd. If not, perhaps they will hang out here on the 10 acres where there is a feeding station in the canyon below and a place of refuge. Unfortunately, that is my human way of planning and hoping. Deer have no such thoughts. Enjoying a wet nose and some kisses from Daisy! My life has become quite strange as a rehabber, and perhaps I take my role as caretaker too seriously. You will find me most mornings out early, doing my deer chores. Pouring fresh water, filling feed buckets with deer pellets, throwing a lump of alfalfa hay in each pen, gathering fallen acorns from the oak tree, and cutting branches from hack berry trees for nibbling leaves. The leaves have fallen from most trees now, even way back in the woods. That trek will become more of a challenge as I clip brambles and vine that deer feed on in winter. Even my rose bushes have become deer browse, getting a trim that I wouldn’t normally do. I know Daisy and Holly love these things, and it is my way of making their diet more interesting than it would be penned up with readily available food humans tend to provide: corn and pellets. Anyone care to “hoof” around a little?? I expected my role as rehabber to have its ups and downs. Certainly, it has been some work and expense. The days are often stressful. Just today, two strange dogs ran loose in the neighborhood and came on the property. Daisy and Holly could not escape their pens and so they racked themselves against the fence again and again while the dogs taunted and tormented them from the outside. Healing begins all over again for Holly, and Daisy’s scarred legs and face will patch up in time. For me, there is much to be learned about what is best for the wild animal, and not so much about what I want or need to happen. 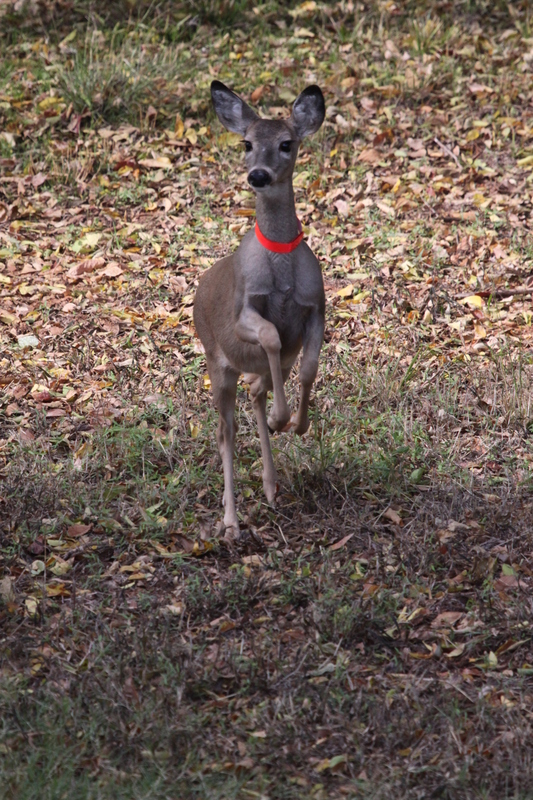 Some could think the deer should be free at this time and to risk the plight of hunting season. It is never easy to know what is the best decision. Looking back on life I could say the same thing. We can say we wish we had done something different. We can critique others and evaluate what WE think they should have done. We can read books and research the internet for answers and to gain knowledge. But frankly, no one can ever say what should be done. Until a person is faced with the reality of a situation, they cannot possibly determine what is the best thing to do. We are forever learning and discovering… what works best, and what was a poor decision. And perhaps that is all there is to it. One does what they feel inclined to do at the time. It turns out good or it doesn’t. We assess the outcome, then simply, move on. No looking back and no projecting the future. That is my experience in real rehabilitation… every day presents a new opportunity to create. Once again, your writings move me, and move me to tears. I am short on words tonight. Please know I love you and being able to read about your life with nature is such a blessing. You just amaze me. Please give hugs and love to all your animal friends there!! Thank you Karen! I read your Life101 email tonight and felt much the same… finding blessings and special meaning in so much of life and interaction with others. I realize my relationship with the animals is an opportunity and journey not ventured by many. I am thankful to experience it and share it with others. Thank you for making the time to comment. It means so much. I love you too, dear friend! The depth of your concern, your concentrated devotion to educating yourself on the animal you take in, continues to amaze me. You have a special talent, any animal that should cross your path is certainly a lot better off because of it. Thank you DS. We all have our niches in the world. Your blog gives me perspective at the start of every day… and often I mull over the subject throughout the day. It’s fairly awesome that the thoughts or works of another can spill over into our lives. At the very least, it opens our eyes to something we might never have thought about or taken notice of. Thanks for your kind comment! That was simply beautiful! Wonderful work you are doing. My life as a rehabilitator is rewarding for the most part. I have my share of heartache but wouldn’t trade the experience for anything! Thank you for reading my blog. Daisy and Holly are both wary of large dogs. Unfortunately, we have had a couple of incidences where large, stray dogs came on the place and cause trouble. 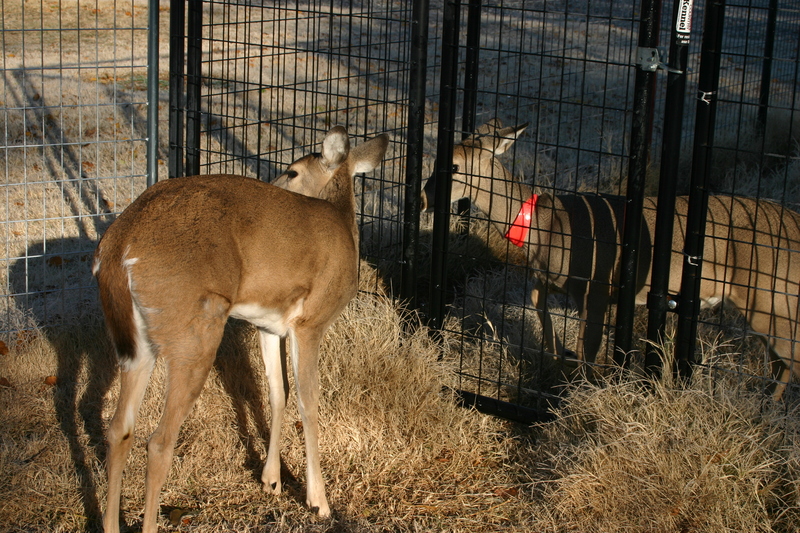 Being flight animals, both deer were banged up from hitting the fences numerous times. Daisy was brought up with our small Japanese Chin so she was familiar with them, like siblings. We don’t allow them in the pen anymore as Holly never bonded with them, and it would be unsafe for her and the dogs. You are correct, it is a worry for me to wonder how it will be for Daisy when she is released. That is the difficult part of raising a wild orphan. Thank you for your input! I hope that Holly will continue to heal and that Daisy will be getting to feeling better too from their injuries. I say that don’t worry about what other people tell you to do, do what is in your heart for when to release them and what you feel is best. Holly improves every day. She still requires a good bit of rest, but she is eating much better, and seems much more alert. It is hard to know what is best. As you stated, we decided to do what we felt was right and what we felt comfortable doing as far as the release goes. Thanks for your interest in Daisy and Holly. It means so much! Thank you for giving so much back to the world, little lady! Thank you! I am just fortunate at this point in my life I can dedicate the time and energy to helping animals. I get the best of everything… a little photography, being with nature, educating myself, and working at home! It is a wonderful life! Oh, I do it gladly. I have always been an animal lover, and I’m happy to have discovered a way I can take part in caring for wild creatures. It is a dream come true to live in nature as I do… a simple farm girl! You are really doing great work. The biggest responsibility to all of us being humans is that we must take care of these creatures of god who are not intelligent like us (although they are intelligent in their own terms). Keep up the good work. You are really a nice person. I think there is some reference to man caring for the beasts of the land. I agree, it is a responsibility, but one I do gladly. I think more people would help animal life if they could. There are many ways to help… we just need to decide what, personally, we can do! Thank you for recognizing that animals need our help. And, thank you for your wonderful compliment. I appreciate you! Thanks for sharing your story about Daisy. What a great oppurtunity you have to care for this amazing creatures. I live in the city, so rehabbing animals on myland or in my home is out of the question, otherwise I would love to do something like this. Keep up the good work. We lived in town for a number of years and we were able to take in a couple of injured birds and raised an orphaned mourning dove in our home. We acquired Harold in August (later discovering Harold was a girl) and released her in February. It is possible to rehab and raise some species in one’s home, but it does take a great deal of time and commitment. Little ones require regular feedings and need help relieving themselves, so often, having a full-time job would be a hindrance. My husband and I worked near our home so one of us was available during those important times to keep to schedules. I hope you get opportunity to experience raising an orphan some time in your life! Thank you for commenting!